Welcome to the October Hearts of the West blog hop and our selected paper pack this month - Sangria! As you make your way through the hop, please leave your comments as we love to get your feedback. If you got here from Anna`s blog, then you are in the right place, but since this is a circular hop, you can start anywhere! When I saw this paper at Convention in July (2015), I was in love!! The colours are absolutely gorgeous!! Pomegranate, Poppy, Eggplant and Champagne - looking at these colours separately, you would think there is no way they would go together, but once you see them together, there is an "Ah ha" moment when you realize yes, they DO work! 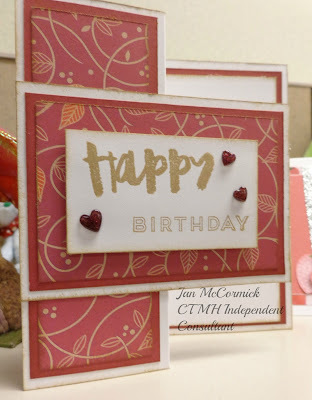 To show how pretty they are together, I made a birthday card using a form of Gate Fold. I used Pomegranate and White Daisy cardstock and the leaves B&T from the Sangria paper pack (X7199B). The Happy Birthday are from two of the Hello Life stamp sets that we promoted in September and stamped in Desert Sand. All of the papers were distressed with Desert Sand as well. I added the three little Pomegranate glitter hearts to add a bit of bling. I took this card to work as I often do with my projects and have an order for two more for a co-worker! That is it for me this month. Since I am the last stop along the way, you can continue on to Nancy`s blog for some more beautiful artwork! Welcome to our September Blog Hop featuring our favourite paper packs. We hope that you will take the time to leave comments on our posts, as we love to get feedback from our viewers, whether it was something that you really liked or some new technique that was used that you would like to learn how to do. By leaving us comments, we get to hear what you like, and what you want to see. Thank you. Now on to our hop! We have six new paper packs in the 2015/2016 Annual Inspirations Idea Book and two more in the 2015 Holiday Expressions Idea Book, and it was so hard to pick a favourite. I finally decided on Kaleidoscope. For this hop I made a one page layout and then played with our Artfully Sent Cricut cartridge. There are so many great images on this cartridge that can be used for both cards and layouts. I picked two of the little pocket cards and cut them in Pixie and Sunset paper then backed them with the Kaleidoscope jelly beans paper. On the layout, I used Sunset paper as well a piece of Canary paper from the Adventure Paper Fundamentals pack. I also used the Kaleidoscope Complements. This is one of the flowers from the Kaleidoscope Complements that I stuck onto a piece of White Daisy and then cut out and popped up with some 3-D Foam Tape. These little pocket cards are just the right size for a gift card. Your next stop on the Cross Canada Hop is Heather's blog. If you get lost along the way, you can head to Michelle's blog as she has the complete blog list.